With a background in adventure travel and event transportation, Wendy leads On The Scene’s ground transportation division. 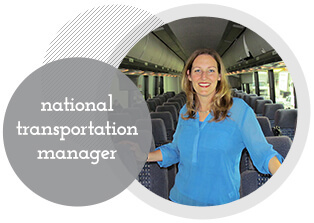 Named by Illinois Meeting + Events Magazine as the 2011 Best Up-And-Coming Meeting Professional, her ability to plan, manage and execute large-scale transportation logistics has given her great respect within the industry in cities across the country. With an eye for success, she offers turnkey transportation solutions from convention shuttles to VIP transfers. Her proven track record and passion for customer service sets her apart from other suppliers. Wendy is an active member of Meeting Professionals International and is always staying current with industry trends.